Transmits phone call to the car FM stereo system. Switch to Hands-free mode from music playing status when receiving calls automatically. Automatically scan the best transmitting frequency. USB output 5V/2.1A to charge other devices. Draws power from the cigarette socket. Plays other external audio sources (such as mobile phone) with 3.5mm cable. Support USB disk & TF card to play music, support MP3 & WMA format. Flexible metallic hose can be bended to any visual angle. Strong and elegant design with LCD screen display, show working frequency, working status (BT Call). With A2DP stereo Bluetooth (optional). 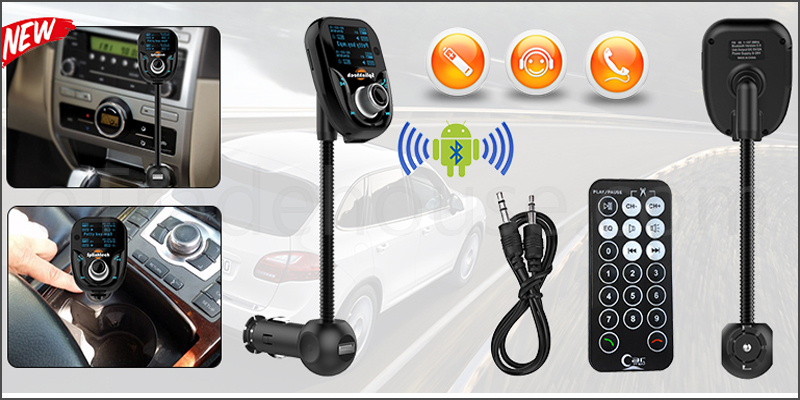 1x Bluetooth FM Car Transmitter Kit.